Aiming at totally bankrupting the Tamil farmers of Koa'raippattu South (Kiraan) division in Batticaloa district, the occupying Sri Lankan military, which schemes Sinhalicisaton and colonisation of the pasturelands in the division, now demand 3,000 rupees per 10 cattle from the Tamil farmers. The ‘Kappan’ military of Sri Lanka has instructed the Tamil farm-owners to pay the money before 25th of this month. 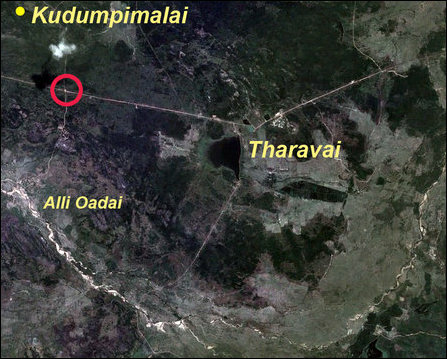 The extortion is taking place in the name of providing ‘housing’ to disabled Sinhala soldiers, the farmers from Alli-oadai village told TamilNet on Friday. Earlier, Tamil paramilitary personnel operated by the SL military were demanding money. But this time, the extortion has reached a larger proportion. The SL military now wants the Tamil farmers to give up grazing their cattle and farming in the area, the Tamil farmers complain. The officers of the occupying Sinhala military have earlier registered the number of cattle owned by the Tamil farmers in the division. They are now using these figures to demand large sums of money from the Tamil farmers. Already, more than 500 Sinhalese brought from the South have encroached into the pasturelands and the Sinhala ‘Civil Defence Force’ paramilitary operated by Colombo has been killing and stealing the cattle of Tamil farmers. The Tamil name of the village Alli-oadai (lotus pond) has also been changed to ‘Aliayaa-oadai’ in Sinhala by the occupying military. Two months ago, the Sri Lanka Army soldiers at the nearby Koaddaik-kallaa'ru were harassing the Tamil villagers for money, showing a letter in English and Sinhala that they were constructing houses for disabled Sri Lankan soldiers. Kappan in Sinhala, related to Kappam in Tamil and meaning taxes or tribute, is widely used today as a word for extortion of money. 11.11.12 Colombo plans to settle 25,000 Sinhala families in Batticalo..
03.03.12 Land grabbed for Buddhist stupa, local people blocked at Kud..
09.07.10 SLA changes traditional Tamil names of streets in Batticaloa..